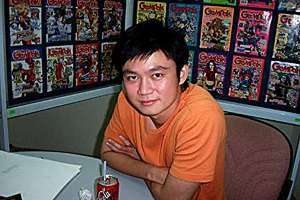 In early 2001, its official website announced: "DC Comics is pleased to announce that Tan Eng Huat, the artist of DC's upcoming DOOM PATROL ongoing series, has signed an exclusive contract. Based in his native Southeast Asia, Tan is a newcomer to American comics who is already earning accolades from those who see it." DC could have been a little more geographically specific: The 28-year-old Tan lives in Kuala Lumpur. He's never been to America but has long weekly phone conversations with his New York-based editor (which he pronounces in the Yank manner: Ediddur). He is on a two-year contract with DC, is paid by the issue and is eligible for royalties. This interview was conducted in the office of Art Square, publisher of the Malaysian comic Gempak that he used to draw for. Tan's English isn't fluent but he gets by. In Teluk Intan, Perak. Then I lived in Johor and then KL. I went to a Chinese school. I've been drawing all my life. Did you know from the start that you wanted to do this? The comic industry wasn't developed then. People who liked to draw all had the ambition to go into advertising. I did have a chance to study advertising in a college for three months. The family couldn't afford the fees so I had to work my way through. That was when I freelanced in comics. I didn't have much time for homework so I gave up studying. You were doing Malaysian comics before this? Yes. After I left school I did art for a Hong Kong comic called Water Margin. The main artist would come here from Hong Kong and we would be like assistants. After that I went to another company that did animation. I stayed there for three years. I was also doing work for "Gempak" comics. I mainly did the covers. Then my friend and I attended a manga convention in Taiwan. There were manga conventions every four years in different countries I met a lot of artists and writers there. I brought my portfolio. Everyone was developing dotcoms then. A Taiwanese company wanted to do a web comic, mangaland.com. The boss invited me to work for him. So I did some work for them until the bubble burst. Luckily, there was another manga convention the year after that in Hong Kong. I thought you said that the conventions were only every four years. They changed it. Four years was too long a wait! It was in Hong Kong that I met the DC editor, Andy Helfer. He thought my work was interesting and when he went back to USA he sent me some sample scripts to try on. He was satisfied and that's how I got the Doom Patrol gig, which started in 2000. Does DC have many artists who reside outside America? Actually, 90 per cent of the people who work on the books are freelancers. There are those who stay in Tokyo and so on. I get the scripts every month from the editor, who gets them from writer John Arcudi (Gen-13, The Mask). I'm on the phone with Andy every week. I will do sketches, which I will send to be approved. Only then do I do the art on large paper. Whatever contact I have with the writer is mainly through email and not as regularly. What has the response been to Doom Patrol? The company seems to like it. Other than that, I don't want to know too much as it might affect my work. Your career seems to have progressed very rapidly. That's only when you look at it now. But when I lost the dotcom job, for a few months, I thought, "What am I going to do now?" Has your work schedule changed? When I was doing the first Hong Kong comic, the conditions were not very humane. Kind of. But the good thing is that it taught me to adapt. I still work 10 hours a day because I'm used to it. Are you the only Malaysian doing work for an international comic? No. 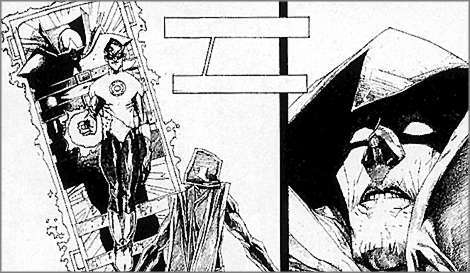 There are two Penang artists who had done art for American comics. Babba Chua did a short story for Dark House Present, and Billy Tan, last thing I know, he's doing Tome Raider. I've never met them though. How complete is the script that is given to you? Is it just dialogue or are you told what will happen in each panel? It's specific in the storyline but not the environment. Sometimes it would say, "In a bookshop" but not much more details. As for which character is in the foreground or background, sometimes I can make suggestions and can change that. In the first few books I used too many lines because I was worried the colourist wouldn't understand. Now I use fewer lines. The writer also wants me to add cultural stuff. Chinese stuff, like in the designs. They like to see new things. I can't change the storyline but I can suggest characters that might be interesting to the story. Speaking of colourists, do you have any say in how the colours will look? So are you taken by surprise when you see the final product? Well, I didn't know that one of the characters was golden until I saw the finished book. Having said that, do you prefer working in black and white or colour? For black and white you have more control. Even though there is some limit to what you can express, that's more than enough for an artist. Colour is more difficult because there are so many options in shades and toning. But as a reader I prefer colour. How far advance do you work? Issue 8 will be coming out this mouth and I'm doing issue 12 right now. Do you someday want to write your own stories? No. I'll leave that to other people. It's better that way. In the future I'd like to try Superman. I'm a big fan. Any difficulties working with DC? The size of the American panels is different from the ones used by the Hong Kong comics but after a few months you'll get used to it. You've been reading comics for two decades. How do you think the medium has changed over the years? Now there's more to comics. They seem to have more merchandise and toys. In the US, since the market is big, they can test new stuff. The future is changing mainly in terms of merchandise. New readers are also coming up, so there's more influence from other countries like Japan and Hong Kong. Growing up, did you get encouragement from people around you or did they think you were strange? Mainly, people thought it would just be a pasttime. That's why going to the Taiwan summit was important, because I met people who were doing it full-time. What would your advice be for someone who wants to get into comics? Work hard! But don't expect to make lots of money in a short time. Learning can also be fast or slow. But first of all you've got to love what you do. Have you started reading Doom Patrol? Um, I have to confess, I started but, rather frighteningly, my attention span wasn't up to it. I'll make time for it later, I promise. Is it like science-fiction? No, not really. It's more based on phenomena, like Amazing Stories. You have to read it. Too complicated to explain. Just read it and see what you think! Note: The above interview was published in BigO #199 (July 2002).